How improper disposal of waste products harms the environment. 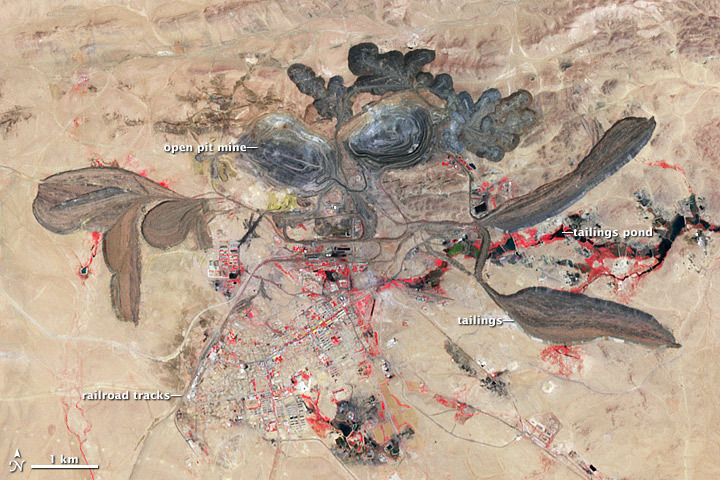 One of the greatest environmental problems caused by the mining and refinement of strategic elements, in this case speaking primarily about rare earth elements, is the problem of waste management. This becomes a problem when mines and refineries that do not adhere to regulations regarding proper waste disposal. This can result in soil and water contamination by substances such as heavy metals and radioactive materials. This affects the ecosystem around the waste disposal site; and, if the contaminants get into the water table, it can affect areas beyond the site. Improper waste disposal is often the largest of mine and refinery pollution Waste is generally categorized into two different types: tailings and waste rock stockpiles. Sedimentation is the process by which erosion of waste piles or runoff from impoundment areas adds layers of sediment to nearby bodies of water. This can alter the path and shape of streams, reduce the light available to aquatic plants, and smother small prey organisms, thus altering the food chain. More sediment layers can also make bodies of water shallower, which can increase flooding in wetter seasons . Rare earth element ores tend to contain high amounts of metals, similar to other types of hardrock. 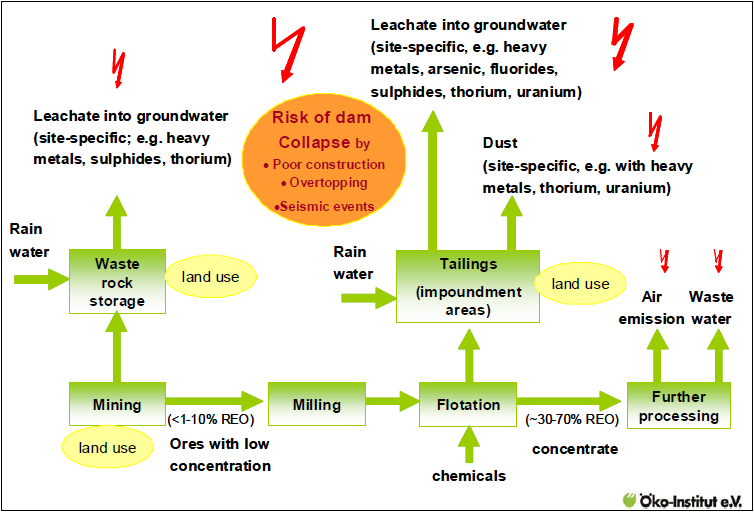 This means that the metal concerns of hardrock mining also apply to rare earth mining. In particular, the elements of concern at rare earth mines include, but are not limited to, aluminum, arsenic, barium, beryllium, cadmium, copper, lead, manganese, and zinc.lead, manganese, and zinc . For more information about the harmful effects of metals, please refer to the environmental problems of refining rare earth elements. Process wastewaters and tailings impoundments formed the bulk of the environmental contamination at the Molycorp Mountain Pass site. Before 1980, the facility used two different types of impoundments to dispose of waste; onsite percolation-type surface impoundments for wastewater, and conventional dam impoundments for tailings. Because of these sites, groundwater has been affected near the mine. The HCl in the wastewater was neutralized with sodium hydroxide (NaOH), so there has been an increase in total dissolved solids (TDS) as a result. Unlined impoundments have been reported to create TDS concentrations in the range of 10,000 mg/L, with background concentrations from 360 to 800 mg/L, including small concentrations of barium boron, strontium, and radiological constituents. Other constituents, such as metals, nutrients, and radiological constituents have potentially had a negative effect on groundwater as well. Two additional off-site evaporation ponds for containing wastewater were constructed in 1980 and 1987; while these two units were operating, there were several instances of failure in the pipelines that connected the new facilities with the Mountain Pass site, which resulted in surface soil contamination. Two wastewater spills were documented at the site during that time; the first in 1989, as reported by EPA, and the second in 1990. The first spill resulted in the surface discharge of 3.375 gallons of tailing and process wastewater from the failed pipeline. The second was larger, and resulted in the surface discharge of 45,000 gallons of process wastewater from the pipeline. Both spills were contained and deemed insignificant, since there happened to be low risk to human life and the environment at that time, but the Mountain Pass site stopped producing several years later. Babich, H., Devanas, M.A., Stotzky, G. (1985). The mediation of mutagenicity and clastogenicity of heavy metals by physicochemical factors. Environmental Research, 37(2), 253-86.